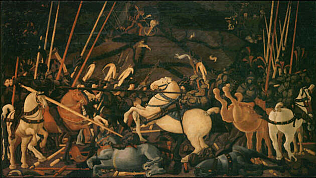 The big wood exposed at the Uffizi Gallery is part of the cycle of three paintings realized by Paolo Uccello that represented the Battle of San Romano (1432), a battle in which Florence won against the Milanese army, allied with Siena, bitter enemy of Florence. The other two paintings are now at the National Gallery of London and in Paris. The painting shown at the Uffizi Gallery was realized by Paolo Uccello near the 1438. Admiring this painting we can understand an important feature of the time during it was realized: the coexistence of the old Gothic style and the new sensibility of Renaissance age. The Battle of San Romano shows the fairytale atmosphere typical of the International Gothic, but also a large use of the mathematical perspective, characteristic of the Renaissance.